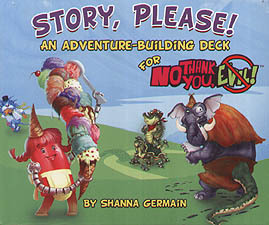 Journey into Storia in adventures of your own design! Combine an engaging STORY card with one or more cool PLACE and PERSON cards to outline your quest. Then give your adventure a surprising TWIST, and maybe some fun and useful STUFF. There are even maps and handouts! Pick cards, draw them at random, or mix and match. Create a great story with all the details you need - in minutes! This expansion requires the No, Thank You, Evil! game to play.